The girls and I finished planting the flower garden in the backyard. The vegetable garden is doing well and all the vegetable seeds and onion sets are now up and a few inches tall. I’ve been helping my Mom and Dad both by helping at their home as well as making lots of phone calls for my dad’s medical issues and Alzheimer’s Disease-related challenges. Updated my Dad’s CaringBridge site so family, friends, and others struggling with the effects of Alzheimer’s Disease know what’s happening. Have been taking Olivia to special ed at the local school to help with reading (she has a couple of learning disabilities that affect how she can process sounds and words) and speech. She enjoys going there, and has made some new friends both in special ed as well as in the second grade classroom where she spends about 45 minutes doing various activity centers with other students. 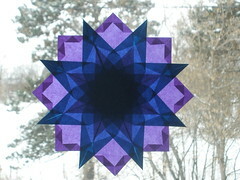 Window star in a pattern I created. Listening to harp music in the home. Sophia is learning to play the harp, and her teacher assigned her a piece called “The Purple Bamboo.” It’s a pretty piece with glissandos. I need to remember how much confidence she has in me now as a ten year old…especially when she’s a teenager and may see things a different way. No major trips are scheduled for the upcoming week. The girls have piano lessons about 45 minutes from here on Thursday, so I’m going to look at places that are near there that may be good for a field trip. On Tuesday, Sophia has harp lessons about 40 minutes from here. There are a few places along the way (including a county park) that would be nice to visit. 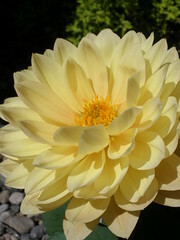 Outside, I’m trying to finish planting one more vegetable garden, and then try to work on several smaller flower gardens. The goal is to have everything done by June 27th when the girls’ 4-H club comes for a visit. I need to rent a log splitter and chipper to get six trees that were sawed down out of the pastures. The trees were either damaged by insects (ash borer), lightening, or wind. I’ve never used either of these pieces of equipment, so it will be interesting to see how that goes. Both the girls are in 4-H, so I’m helping them with their first demonstrations as well as providing guidance with some of their projects. This, along with doing projects for the county fair (in the open class division), is a major focus of the summer. It gives the girls opportunities to learn about new subjects that are different than what they learn during the “formal” school year (September-May). The focus during June-August is learning new skills and doing activities that they may not have time to do during the balance of the year. 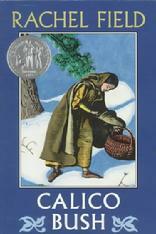 I’m reading Calico Bush to Sophia. It won a Newberry Medal and is a book that we’re both enjoying. Olivia listened to it for a bit, but it didn’t interest her as much as some of the other books I’ve read to the girls. During the upcoming year, one of my homeschooling goals for the girls is to read a significant number of Newberry Medal winning books to them, with the eventual goal of reading all the books. We also are going to read all the Caldecott books (we’ve read over 30 so far). I’ve been enjoying the flowers this year, and am so happy to see some of the perennials already blooming. The irises just started blooming this week. The girls and I transplanted them last year and they didn’t bloom. I was worried that they wouldn’t fare well moving from a shade to sunny garden. This year, there are many blooms…all beautiful shades of purple (one of my favorite colors). Here’s a flower from one of the big containers that I helped my dad plant in May. I think it’s such a pretty flower. Visiting from the Homeschool Mother's Journal. Love the window star! A friend made one for me awhile back. They are so beautiful!